Lelouch of the Rebellion: Hime-sama...? Ou-sama...? Nani kore?! Minitokyo »	Lelouch of the Rebellion Indy Art » Lelouch of the Rebellion: Hime-sama...? Ou-sama...? Nani kore?! Promo for the contest on . It was basically made so that everybody see what I meant when I said about combining two scans. If you think his head is too big, it's only because the legs are cut on an unfortunate length. I worked that out after a lot of measurements. Really. Hopefully you'll understand the theme of the contest better with this. I foresee a period of twisted gallery items. I really like your vector, it's sweet in many ways. I think his head is too big though, except for that, everything's really cute. O.M.G.! I am speechless. This is just so weird, but OMG, it's AWESOME! He look really adorable in that dress with that expression. so sweet like the peach dress shades and the strawberry he is holding. great work! HAHAHAH awesome!, great job, it looks great, ! I hate Suzaku so much and this art priceless! well I am a suzaku hater so I guess I'm biased, but this is just TOTALLY GENIUS. The proportion of the head, neck and body seem to be a bit off, but other than that, this vector is great. 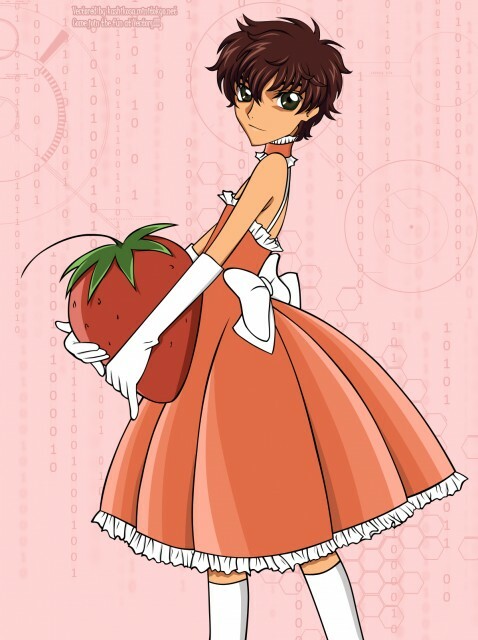 ^^ And it totally tickles me to imagine Suzaku being a strawberry-princess... LOLZ :P Thanks for sharing!